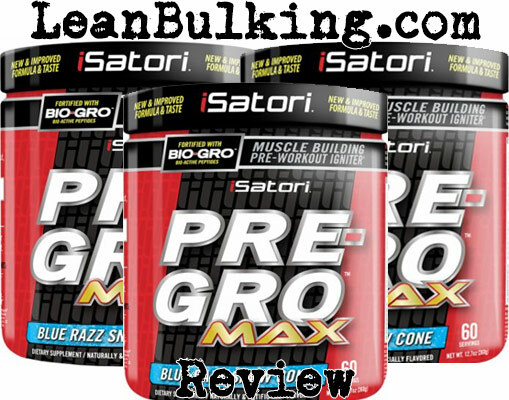 iSatori Pre-Gro MAX™ Review | Expert Analysis | Does It Work? 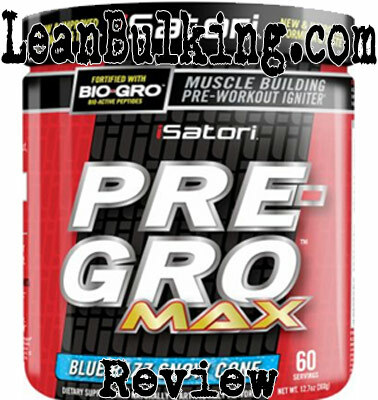 Pre-Gro MAX is a pre-workout supplement made by iSatori Inc. It costs $39,99 for 60 servings on their website, and it comes in 2 flavors - Blue Razz Snow Cone & Mixed Berry Fruit Smash. Sounds tasty, but what's more important is the ingredients inside; we'll take a look at that in the next section. iSatori Inc are USA-based supplements company that were founded in 2001. They aim to "create the most sought after nutritional products and solutions for building a better body". They market a range of supplements - from whey protein powders to fat burners and this pre-workout. iSatori are also sponsored by some respected athletes, such as Siera Capesius - so let's see whether Pre-Gro MAX can live up to their reputation below. From first glance, Pre-Gro MAX seems like a well-priced pre-workout. 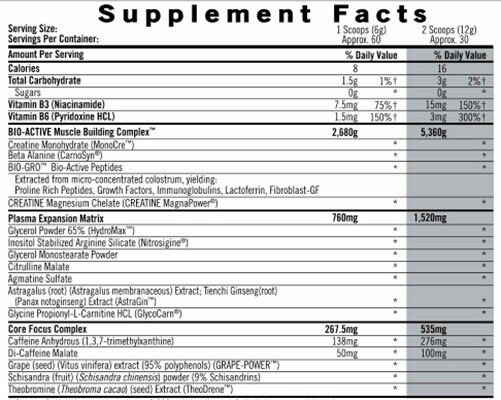 However, we also noticed how big its ingredient list is - this contains over 15 ingredients, which is a HUGE amount to have in 1 supplement - we prefer products that contain 4-6 effective ingredients that're proven to work. We were actually impressed that iSatori had included some of our favorite pre-workout ingredients, but the amount of ineffective ingredients (and nutrients that can cause side effects) started to lower our opinion of Pre-Gro MAX. Proprietary blends are mixtures of numerous ingredients that are only shown to you as 1 quantity. This means you don't know the dosages of each ingredient inside these products (unless they're given to you) - this increases your risk of side effects, as well as you wasting your money. Basically, companies use these blends to hide ineffective dosages of ingredients inside - making their supplements mostly useless but allowing them to keep the prices high. You can see that only the dosage of Caffeine is given to you on Pre-Gro's ingredient list below. Anyway, we'll analyze each ingredient inside this pre-workout - so you can see how effective it really is. This is one of our favorite pre-workout ingredients; it's proven to improve your strength and endurance in the gym, and has been used since the 1980's - making it one of the most reliable ingredients available. Olympic athletes used Creatine during the 1990's, so everyone knows it works - you can't argue against it. However, as it's in a proprietary blend, no-one knows whether it's contained in an optimal dosage or not (so it might not work in Pre-Gro MAX, as you need at least 1,000mg). This is a great example of why you should avoid supplements that contain proprietary blends). As always, we have mixed opinions about this ingredient; it's shown to enhance muscular endurance, but it causes a side effect called paresthesia (find out more in our side effects section later on in this review). It's one of the most common side effects associated with pre-workout supplements (as Beta-Alanine is very popular in these supplements). As Creatine offers the same benefit, we don't see a reason why companies need to add this too. All you need to know about this ingredient, is that it doesn't deliver any benefits to improve your workout - making it a useless ingredient in Pre-Gro MAX. The worrying thing is, as this ingredient is part of a proprietary blend, it could be filling up most of this product without you knowing it (which would mean most of Pre-Gro MAX is useless). Another great example of why we hate proprietary blends. This is a patented form of Creatine - but as Pre-Gro MAX already contains Creatine Monohydrate, there's no need for this to be in here. Remember that Creatine Monohydrate is the most reliable form, and there's no need to try and fix something that isn't broken. We've grouped these ingredients together as there's one 1 thing you need to know about them: they don't offer any benefits to improve your gym session. For this reason, these are useless ingredients inside Pre-Gro MAX; again, we have to remind you that this is part of a proprietary blend, so it might be filling most of this product without you knowing (which would mean you're wasting your cash on this). Citrulline Malate is one of our favorite pre-workout ingredients, as it's proven to enhance your muscle pumps in the gym - a great benefit of taking a pre-workout supplement. However, studies have shown that it only works in dosages of 6,000mg per serving; as it's part of a proprietary blend, there might not be enough Citrulline Malate inside Pre-Gro MAX for it to be effective. We've also grouped these together as they're shown to be ineffective at improving your gym sessions in numerous studies. Again, these could be taking up most of hte space in the proprietary blends, meaning you'd be wasting your money buying Pre-Gro MAX. Caffeine is our favorite stimulant in any supplement, as it's proven to boost your energy levels, strength, endurance and even focus in the gym. You feel its effects almost instantly, making it a perfect ingredient in a fat burner. iSatori must know the bad points about proprietary blends, as they've provided the dosage of Caffeine in Pre-Gro MAX (its one of 2 ingredients they've provided the dosages for). We always recommend that you consume under 200mg Caffeine per serving in pre-workouts, so the 138mg is a sensible dosage here. For this reason, Caffeine is probably the only ingredient in Pre-Gro MAX that will actually work - it's a shame iSatori didn't dose the other ingredients optimally and provide the dosages on the ingredient list for us to see. This is simply Caffeine mixed with malic acid - there's a 50mg dosage of this inside Pre-Gro MAX, which still means you're under the 200mg Caffeine safety limit for pre-workouts. We'll give iSatori credit where it's due; they've dosed the Caffeine in Pre-Gro MAX well, which is something many other companies fail to do. Some studies have shown Grape Seed Extract to be effective at improving your blood flow (which would enhance muscle pumps). However, there have also been many showing that it doesn't work; this makes Grape Seed Extract an unreliable ingredient. Not only that, as it's part of a proprietary blend, there might be a tiny amount anyway - meaning it wouldn't work. This is a type of berry...we'll cut the bullsh*t and give you the truth - Schisandra hasn't proven to deliver any benefits to improve your gym session. For this reason, it's a useless ingredient in any pre-workout supplement. But that's not worst part; Schisandra has been reported to cause numerous side effects (we'll expand on this in the side effects section). Finally, the last ingredient inside Pre-Gro MAX. We're sick and tired of analyzing useless ingredients, and Theobromine is another sh*t ingredient in Pre-Gro MAX. Simply put, it's a stimulant found naturally in cocoa (chocolate), but there's already enough Caffeine in this pre-workout; all Theobromine is doing, is increasing your risk of experiencing jitters and energy crashes. As no-one knows the exact dosage of Theobromine in Pre-Gro MAX (as it's part of a proprietary blend), expect to suffer from these side effects after taking iSatori's product. We must sound like a broken record player by now, but your risk of side effects are increased for one reason; Pre-Gro MAX contains 3 proprietary blends, so you don't know the exact dosage of each ingredient inside. Not only that, Schisandram, Theobromone & Beta-Alanine can all cause side effects; personally, we wouldn't pay for any supplement that has a risk of causing any side effects. Caffeine should be the only stimulant in any pre-workout you consume; it's the safest and most reliable form that won't cause any side effects when consumed in dosages less than 200mg per serving. Other stimulants such as Theobromine aren't as reliable, and are more likely to cause side effects. Click Here to see pre-workouts that don't cause side effects! Our first opinions about Pre-Gro MAX weren't amazing, and after analyzing each ingredient inside this pre-workout - we've lost most respect for this product. There's simply no need for companies to use proprietary blends in their supplements; all they do is put you at risk of harm and wasting your hard-earned cash! Think about it...if a company spent the money to dose ingredients perfectly, they'd shout it from the rooftops (why would they spend money on something good without advertising it?). As a result, we they hide the dosages of ingredients in proprietary blends, it always means they've cut costs by under-dosing most of their ingredients (trust us, we've worked in the supplements industry for over 20 years). Not only that, Pre-Gro MAX can cause numerous side effects - we always avoid pre-workouts that can cause side effects, after having bad experiences with some in the past. Pre-Gro MAX can’t compete with our favorite pre-workouts on the market; it doesn’t contain as good ingredients, and it has the potential to cause side effects.